Feeling a little bit flush around the pockets, and can’t wait to splurge all that newly acquired money? Well, here’s a home improvement idea for you – the Crosswater Rio Light Circular Shower Head. 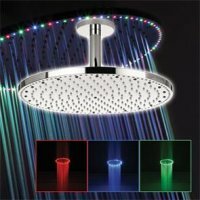 RIO, a brand new ultra thin shower head providing a spectrum of stunning color effects with 96 LED lights programmable by a key pad. The low consumption LED lamps create a column of water and light with a diameter of 400mm working perfectly with 3 bar pressure. The shower head includes the shower arm. We recommend a minimum operating pressure of 3 bar. At £2,191.30 a pop, only the well heeled need apply. As for the ordinary working class, we can get back to our dreary lives, waiting for the clock to turn 5 so that we can punch out and head towards the local tavern for some ethanol-induced relief.